Happy Friday everybody! 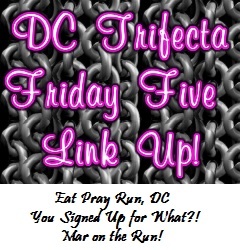 This week for the Friday Five, Mar from Mar on the Run, Cynthia from You Signed Up For What? !, and Courtney from Eat Pray Run DC have us revisiting a theme from a couple of months ago – five things about me. Be sure to check out my post from the end of February when this theme was first visited. 1. When asked where I’m from, I often find it a difficult question to give a simple answer to. I was born in DC, moved to Illinois when I was 11, came back to the DC area for college, and have stayed out here ever since. 2. I’m OCD with cleaning and organization. How OCD am I? 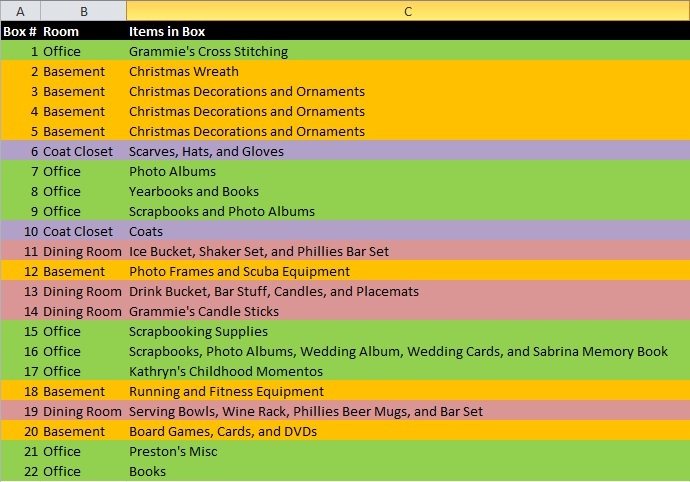 My color coded moving spreadsheet of what’s packed in each box says it all. 3. I’m super picky, which is showing its full light as we’re shopping for various things for our new house. At the rate I’m going in making decisions about what to buy, it’ll be years before our new house is fully furnished and decorated. 4. I am VERY goal oriented. 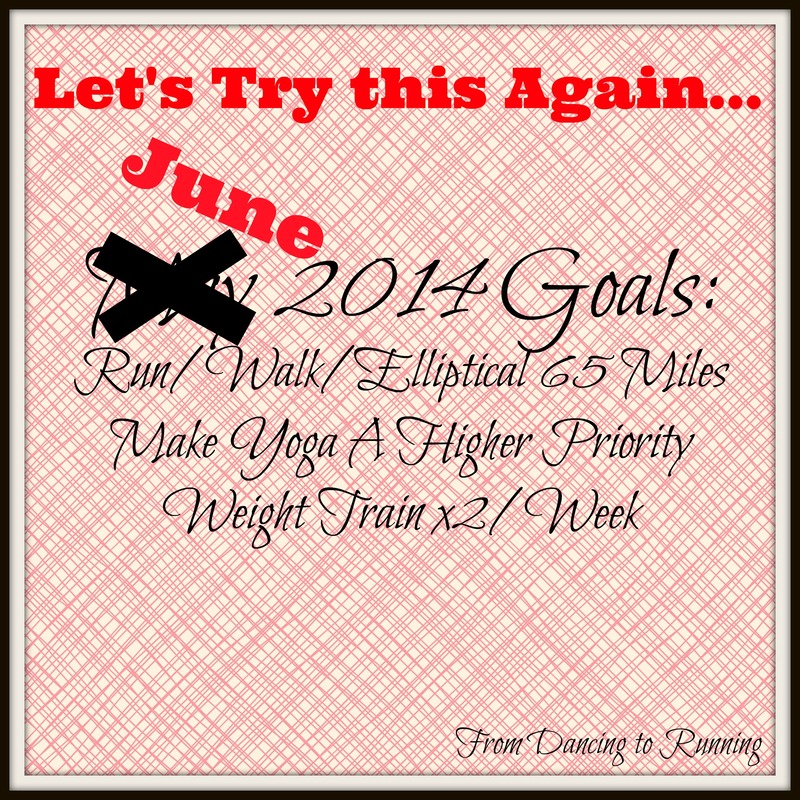 Was that not already obvious by the monthly goals that I set for myself? 5. I have always been a super busy person. I have a double bachelor’s degree in History and Secondary Education (yes, I was one of those crazy students who double majored in college – the School of Education actually required secondary education students to have a primary major outside of the school), and a master’s degree in Integration of Technology in Schools. During undergrad, I wrote an 80 page “senior” thesis (I wrote it junior year to avoid completing the research while student teaching) on the history of McDonald’s marketing to children. I taught full time during my two years of grad school, and planned our wedding as well during my first year of the program. All six years of college and grad school were completely exhausting, but so worth it! QOTD: What is your favorite “about me” question? I often tell myself the same thing, but then when I have a few moments to sit I start asking myself what I can do next! Wow can I borrow your organization chart?! We have a lot of OCDish in common! I thrive off being super busy but now I’m not sure it that’s such a good thing [for me]. I know its not good to not have any downtime, but when I do I start finding things to do because I don’t want to be bored. My husband has similar habits, but luckily he has learned to just let me do the organization thing. He has other strengths that I lack. O my, I am impressed with your chart…lol. and glad to see you are a phillies fan! We’ll be going to a game on July 4th! I did what you did. 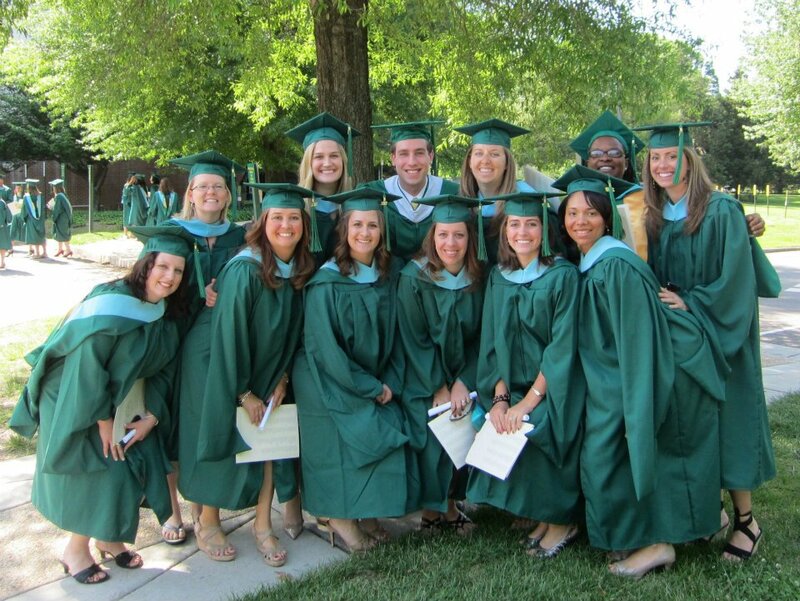 I had a major and then did the secondary education route ( and then multiple certification). It took a while to get through it all but was so worth it! My husband is a huge Phillies fan. He’s already been to one game this season, and we’re planning to go to Nats Park to see them when they’re here in August and September. I am also very OCD…..planning trips with markers, folders, pocket organisers, you get the picture. Good luck with the new home. Houses are always a work in progress! Its nice to know that there are other OCD crazies out there! I love your spreadsheet! You must have great organizing skills! Thanks, I don’t know how I’d survive without being organized. I try to stay organized for those big moments, like moving and packing. But I wish it flowed more into my every day life. Once I had my daughter, all my organization went out the door. It took me a long time to accept that my house and life was going to be a little out of order for a few years. Some weeks life definitely isn’t as organized as I’d like it to be, but I think to think that at least I’m trying. Its the thought that counts most. Boo to being sick. Hope you feel better soon! My husband wishes I would be a little more relaxed about cleaning, lol! I LOVE your organization girl! I think it’s a teacher thing! And so impressive about your double major and teaching full time while going to grad school! Have fun with the house decorating! I’m married to someone who would LOVE your color-coded spreadsheet. When we moved into our new house, we had a scribbler that listed every single box we had packed (of course the number was written on the box and then that number was written in the scribbler with a brief description of what was in the box). I’ll have to show Mel your pic of your spreadsheet! That’s exactly how we’ve been packing – number on the box to match up to the spreadsheet. Wow, that OCD chart is crazy!! My husband would love it! Im more of the organized chaos type of person! That’s how my husband is. Opposites definitely attract! I love your moving chart! I wasn’t quite that organized with our move but I would definitely use something like that if we move again 🙂 good luck with all the moving stuff! Your organization style sounds very similar to mine! Everything has a place, and then you know exactly where to go to grab it. I got married two weeks after graduating with my second master’s degree (while of course working full-time). Silly me thought, “Oh, it’ll be great! I’ll be done with school then can celebrate!”. I never considered all the planning (from clear across the country) that would be involved! I wouldn’t recommend that to anyone! I hear ya! I finished my summer semester of grad school 72 hours before our wedding. There were several all nighters the week we got married – I did wedding stuff during the day and worked on my grad school portfolio at end. I was a mess by the time our wedding day arrived! I had a binder for moving, with checklists and things. Love that spreadsheet! The spreadsheet has multiple tabs – everything has to be kept in one place!